I came across the work of Lori Early last weekend in SoHo's Opera Gallery. Her work was so striking and beautiful that it drew us in from the street. 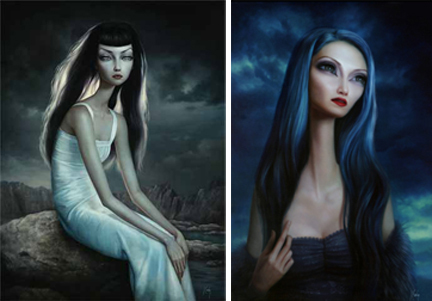 All of her paintings have a certain eeriness that grabs your attention. The big gothic black frames enhance the grandeur and mystique of the images they contain. Once you see the paintings up close you are drawn in even closer by the fine detail, until your nose is almost touching the surface and you have to fold your hands together to keep from reaching out and touching the hair or fur. Neither the artist's site nor the gallery's site do the paintings justice. Her show has only been on for about a week and already all of her paintings have little sold stickers beside them (each selling for a reported $55,000-$95,000).